A mutual fondness for 17th Avenue came to mind in a conversation with friends, Harvey and Margaret Buckmaster, my former neighbors in Bankview. Much like ‘the Buckmasters’, I love Calgary, its historic neighborhoods, treasured old homes and buildings. Harvey said that a seasonal stream came out of Bankview probably as a result of underground springs and meandered down and across what is now 17th Avenue. He also mentioned a small pond in the green space at 8th Street and 17 Avenue, now Tompkins Park. Later donated to the City, the park across from the preserved Devenish Building is at the heart of the Avenue today. Harvey and Margaret neighbors on 19 Avenue, helped preserve inner city Bankview district in the 80’s by attending community meetings, knocking on doors to meet residents. They engaged citizens in zoning decisions and their phone lines buzzed with Bankview news. 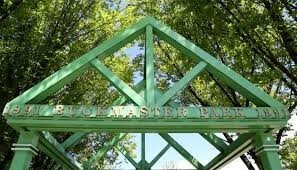 To this day, Buckmaster Park, remains a busy inner-city recreation and meeting spot in the community. 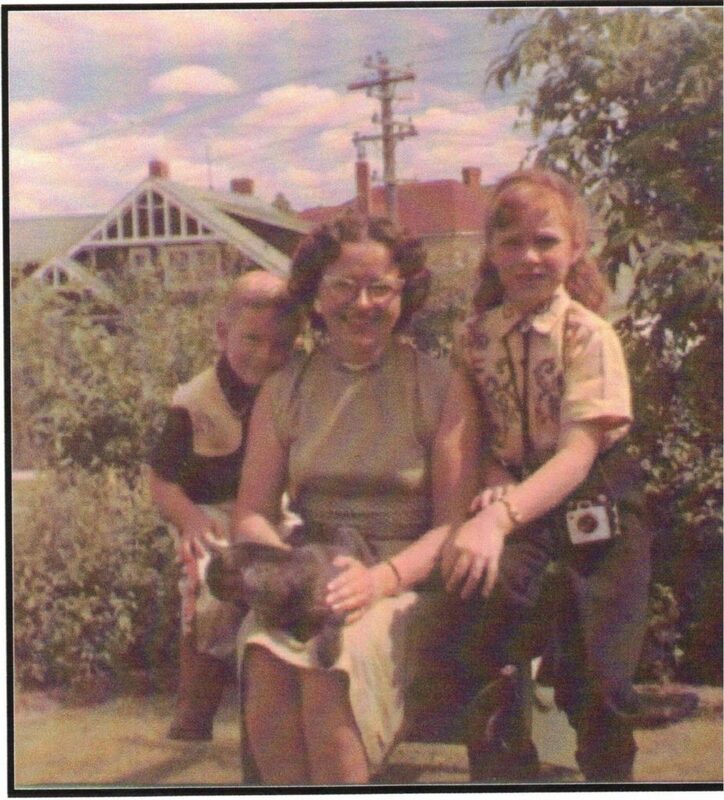 Growing up on Bankview Hill, I was inspired by the Buckmaster’s heritage home and its history. At a young age, I was often invited to lunch by the original owner, Mrs. Webster, widow of early hoteliers who owned Hotel Wales and Hotel Royal. Her unique home intrigued me, its winding staircase, gum-wood fire place, the ball-room where parties were held and the hidden storage room behind a basement wall. Her stories sparked my interest in early Calgary history, its people and their mysteries. I marvelled at nearby 17th Avenue. At night, that sparkling strip of lights leading to the Stampede Grounds from our family home seemed to go on forever. I was not allowed to take my bike there because it was too busy and too steep for me. I had to settle for watching cars roar into the downtown. I wanted to know more about 17th Avenue. “Don’t go down to 17th…your bike has no brakes.” my parents said, setting the avenue boundary for me. ‘Children’s Day’ at the Calgary Stampede’s Grandstand Show was a big deal. 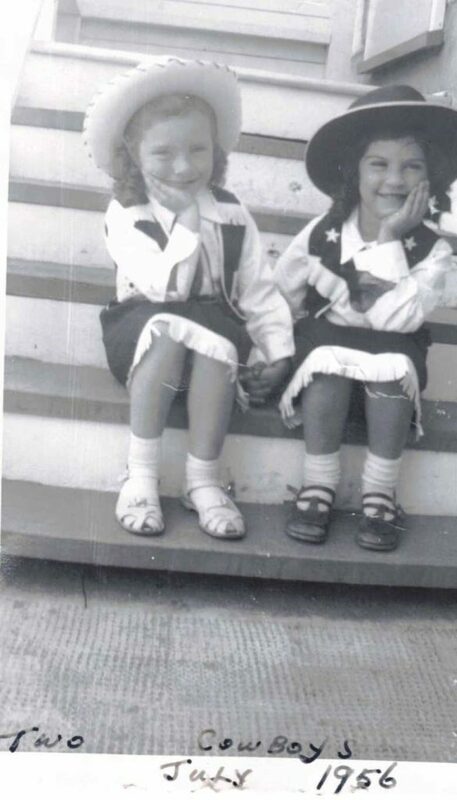 I dressed for the Stampede in the fifties in my fringed skirt and straw hat with a whistle, my family and friends took the bus to the Stampede, just off 17th Avenue. I hoped to win a pony or a bike. We watched the Stampede Parade wind its way downtown but the only prize I won was the memory of that day. As a pre-teen, I rode the ‘Killarney 17th Ave’ bus downtown to the Palace Theatre. After a matinee, we had lunch at the Woolworth’s diner and ogled the jewellery in ‘Birks’. On 17th, ‘The Homesteader’ was one of the first family restaurants in Calgary. Later ‘George’s Pizzeria’, across from Western Canada High School pre-dated popular late-night food spots. 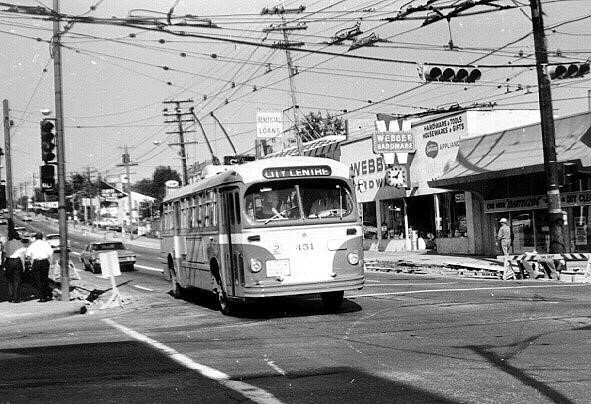 We frequented 17th Avenue for everything—new shoes, groceries, banking. No Saturday was complete without my Dad’s trip to Webber Hardware for nails and house and garden tools. Webber Hardware for nails and house and garden tools. 17th Avenue’s evolution was one of many growth spurts of our city. I travelled the Avenue by cab to Kindergarten as a five-year old, walked across 17th to Scarboro Church and crossed carefully to the sandstone school, Sunalta in my teens. My classmates were the Baby boomers, many still my friends today. Every street has a story. I remember after a junior high dance at Sunalta School, I had my first kiss near Sunlight Grocery on the avenue at 18A Street. In my yellow satin, A-line dress, home-made by Mom, we danced to the Beatles, “I Wanna Hold Your Hand’. My grade 7 class learned a new dance to Chubby Checker’s song, ‘The Twist’. Later that night, Jimmy walked me home and gave me a kiss goodnight. Bright with street lights, head- lights and a few stars, the Avenue was golden then. I grew up and so did Calgary. Those were the ecstatic days of Beatlemania — ‘She Loves You, yeah, yeah, yeah’. Our city became a destination, its welcoming motto changing from ‘Heart of the new West’ to ‘Be part of the Energy’. 17th Avenue always had potential. The first retail successes in the 60’s were ‘The Junior Shop’, for teen clothing, ‘The Barbary Shop’, for boho accessories and Twardowski’s shop which provided a hint of the ‘Psychedelic Age’. Later in the 1960-70’s, ‘June Dyson Antiques’, ‘Switzer’s Interiors’, ‘Bashford’s Antiques’ and ‘Presenting Italy’ appeared. In my twenties, I moved to 18 Avenue near Thompkins Park just to be closer to the action. My interest in the Avenue escalated as it was the ‘hip’ inner city and many friends of mine had moved to the suburbs. ‘Harlow’, Calgary’s first vintage clothing store caught my eye, owned by Dianne White, a school-mate from many schools: Bankview, Knob Hill, Sunalta and Western Canada High School. At 930 17th Ave, she curated antique hats with veils, furs, pointy-toed shoes, skinny-stretch ski pants, satin and lace, with styles from the 40’s delicately displayed in her window. She started the trend in vintage and antique clothing and was featured in Calgary Magazine. In the 70’s, 17th Avenue morphed into a true speciality district. In 1979’s, I quit my high school teaching career to start a marketing company to promote the area. Writing about Calgary was my first love. However, I soon found that publishing is not just a game of ideas. I spent most of my time selling the concept of a specialty street called Seventeenth Avenue. In 1979, I plunged into the publishing industry— a 16-page tabloid newspaper called ‘Seventeenth Avenue’ was born. With a start-up budget of $200 for cards and paperwork, I walked along the Avenue to meet the people who made it great. Shops such as ‘The Establishment’, ‘Walls Alive’ and the newly built ‘Mount Royal Village’ were adding to the design flavor of 17th. 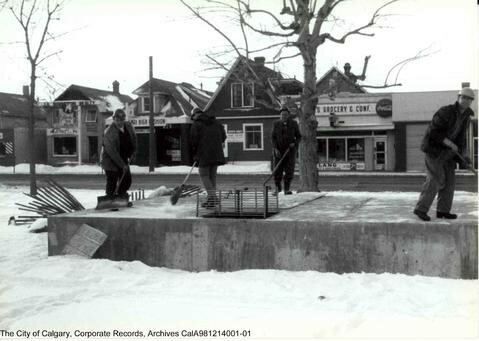 The popular ‘My Favorite Ice Cream Shoppe’ had its start on 17th Avenue west of Tecumseh in Killarney, later moving to its present location in nearby Altadore. 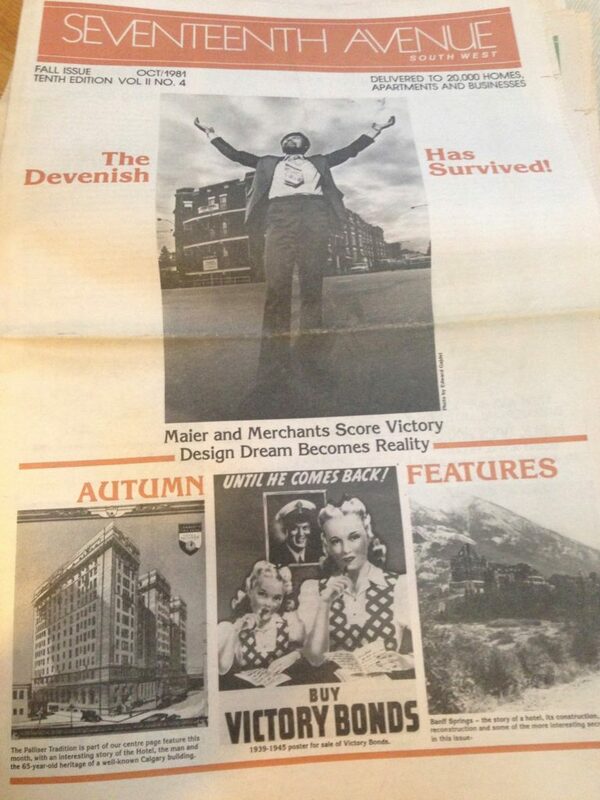 In 1980, Christopher Meier was refurbishing the Devenish, an exciting task. I met business owners like David and Pam Haight of Rubaiyat as well as gallery owners, interior designers and restauranteurs. Envisioning this venture as a new-found writing career, I soon found what made newspapers work; it was the advertising sales. Anchored by my high school, Western Canada at College Lane, 17th Avenue became the home of my little tabloid newspaper. At first, my office was in my home, then in the basement of a two-storey house within sight of the Stampede Grounds. Circulation rose to 60,000, delivered free to select Calgary homes. Customers came from the suburbs for ‘one of a kind’ items. The Avenue was becoming an intriguing place- ‘in vogue’. In an age before computers, the historic and modern articles sparked people’s interest in Calgary. Avenue Advertising Ltd. published 15 issues in three years. Our 1980 editorial predicted that ‘17th Avenue would become a pedestrian-zone, car-free where art shows and festivals would enliven Calgary’s street life.’ Avenue published in Spring, Fall and Winter printings. 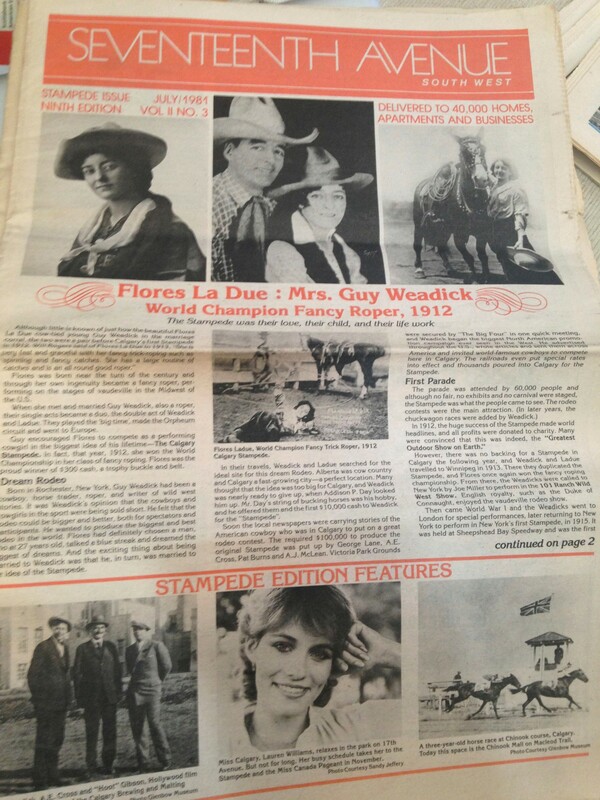 Guy Weadick and his wife, trick-roper, Flores Ladue graced the cover of the ‘Stampede’ Edition as our summer edition offered rodeo stars and cowgirls, tales of the Big Four and Weadick’s original concept of a Western Exhibition and Show. Other Calgary historical favorites such as Pat Burns, Nellie McClung and Peter Prince were featured. Interviews with well-known Calgarians such as Jack Peach helped readers to relate to the early days of Calgary. Tom Baines spoke of St. George’s Island and the founding of the Calgary’s Zoo. His stories of bicycling to pick up food for the animals helped us remember that our city’s beginnings were simple and relied on committed citizens. Ruth Gorman, activist for women and indigenous rights was the long-time publisher of ‘Golden West’ Magazine. Her encouragement and awareness of Calgary’s past added local color and a sense of continuity. From bagels to ice cream, Inuit art to fashion jewellery, the Uptown was making a splash and 17th Avenue was the new hot spot. ‘In 1981, the Seventeenth Avenue Newspaper called the Avenue–‘Uptown 17th,’, branding many districts as one area, bordering on Bankview, Mount Royal, Beltline, Killarney and Mission. It became the ‘Uptown’ because it was NOT downtown. Mid-century houses and shops were place-holders of the past, historic gems along the avenue, a comfortably human-scale architecture. The new Business Redevelopment Zone or BRZ adopted the new name, ‘Uptown 17th’, flying flags with the slogan along the full length of the Avenue up to 14 Street. Gloria M. Strathern’s Alberta Newspapers, An Historical Directory, 1880-1982 noted that 17th Avenue was published in 1979 by Avenue Advertising Ltd, later called Calgary Avenues, 1981-82. The North Hill News, fore-runner of the Calgary Sun published an article about the paper called ’17th Avenue- Pat Paterson’s Passion’. CBC featured a story and interview on the paper and its origins. A staff of 5 handled advertising sales and content. Advertisements filled the pages as Perry Graphics rolled the web presses every two months. 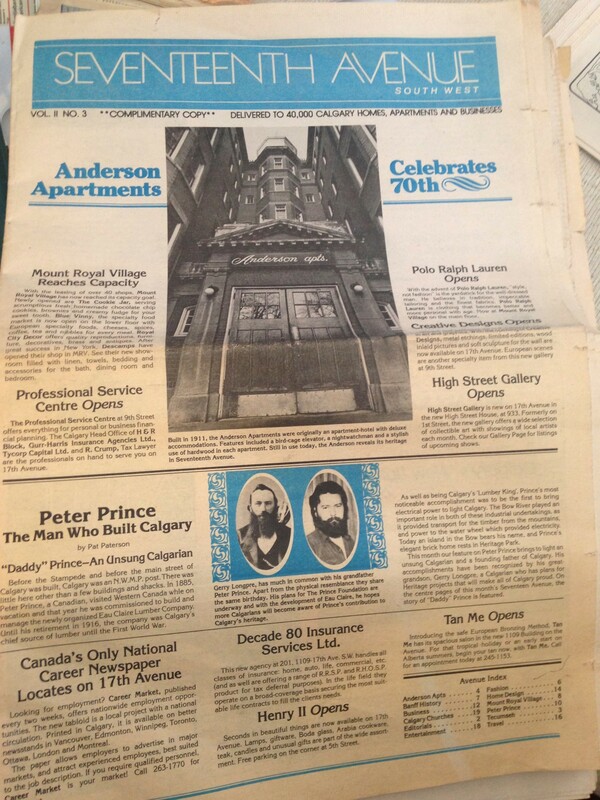 An interview with Peter Prince’s grandson revealed a Calgary legacy. Born on the same day as his grandfather but 100 years later, Gerry Longpre’s shared photographic evidence of Prince’s genius. Peter Prince is remembered ‘The Man Who Built early Calgary’. 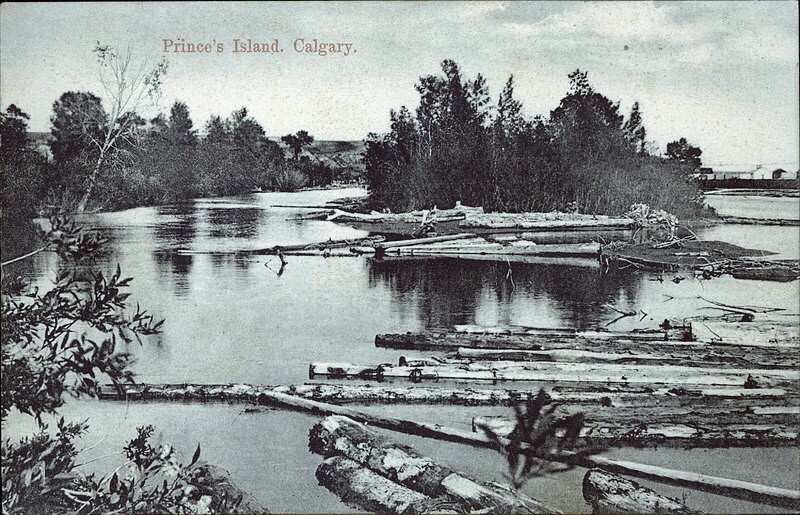 Eau Claire Lumber Company in Calgary floated logs from the Kananaskis to build the early wooden town of Calgary. That version of Calgary burned down in the fire of 1866 and was rebuilt in sandstone on land further west. Prince’s foresight started the electric company that was later sold to the city, the origin of Calgary’s current utilities. 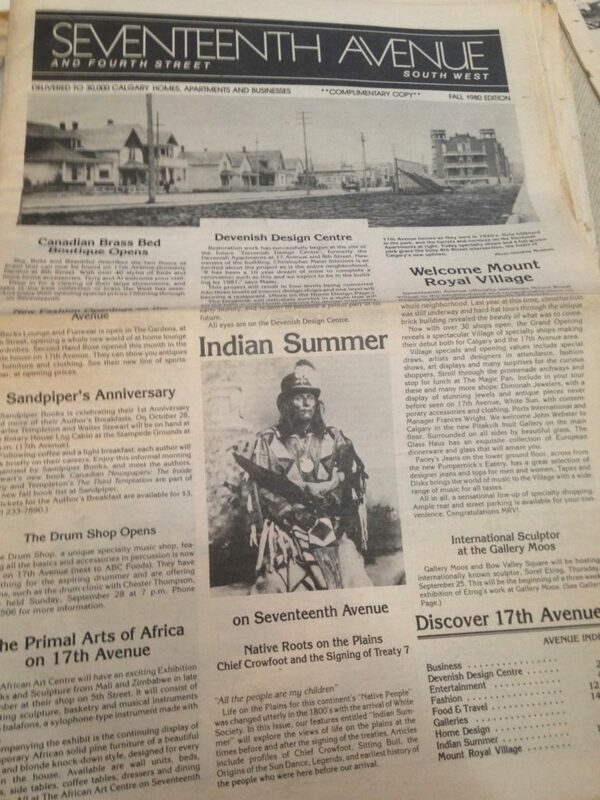 In 1979, my next-door neighbor on 18th Avenue, Richard Wagamese (then known as Rick Gilkinson) wrote for our newspaper. His piece, entitled ‘Tribal Drums’ was one of his first published articles before his prodigious novel-writing career. His authentic writing style struck a chord with readers. Richard informed me that reading and writing for the tabloid, 17th Avenue Newspaper gave him the needed confidence to take up writing as a career. He began to write a regular column for the Calgary Herald and later became a respected author. Wagamese’ novel, based on his life as an Ojibwe boy during the ‘60’s scoop’ resulted in a searing novel, ‘Indian Horse’. Published in 2012, Wagamese’ story portrays the main character, Saul Indian Horse at a tender age as he was apprehended and forced to attend the residential school. There he witnessed cruel treatment yet developed a talent for hockey, coming up against the realities of racism in Canada as he pursued his passion. Soon added to the Alberta Curriculum for High School English, ‘Indian Horse’ was widely read. Richard was approached by Director, Stephen Campenelli, former cameraman of Clint Eastwood. The 2017 film adaptation of the same name has proven a focus for Canada’s Truth and Reconciliation Commission of Canada. In 1980, the Downtown Business Association invited the company to promote down town. 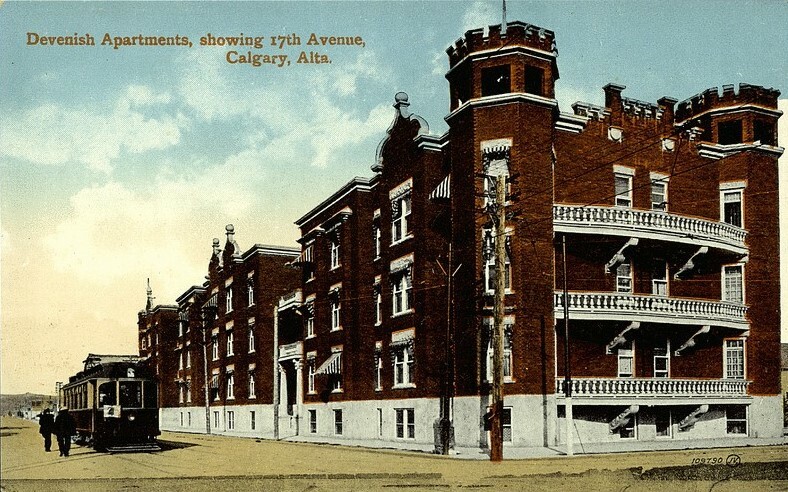 ‘Calgary Avenues’ became the new name. 4th Street, Kensington and Stephen Avenue were added and was recognized as a Canadian newspaper by the Canada Press Council. 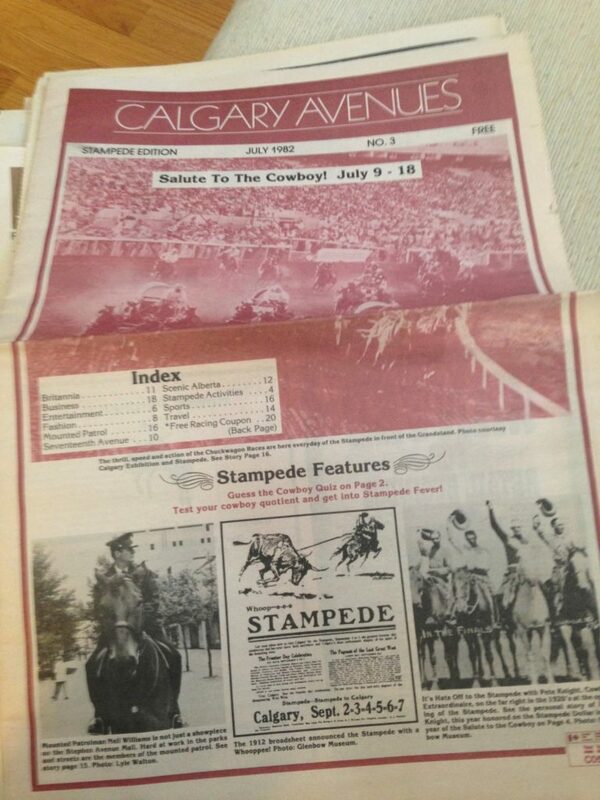 However, falling advertising revenues during Calgary’s biggest economic slump, meant the end of the tabloid in 1982. Many early businesses are lost to memory such as The Establishment which boasted 24-karat gold faucets and fixtures. Other retail outlets weathered the economic storm such as the popular restaurant called Prairie Dog Inn, (PDI) now Buon Giorno. Walls Alive, Rubaiyat, Ethos in The Devenish and Mount Royal Village continue to be well-anchored on 17th. Established in the Model Milk Building, Suncatchers Design Studio later moved their stained-glass production to Bragg Creek. 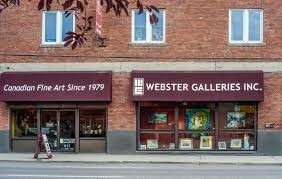 John Webster and his Pitakvik Gallery began on 17th Avenue in 1979, later moving to the historic 11th Avenue location, as ‘Webster Galleries’. For nearly 40 years, the gallery has displayed two floors of original Canadian art, framing and an extensive collection of Inuit carvings. 17 Avenue thrives, adding newer buildings and businesses. Unfortunately, the rents grow too. People revisit their favorite places to spend quality time, meeting for coffee, beer, conversation, walking, or yoga. 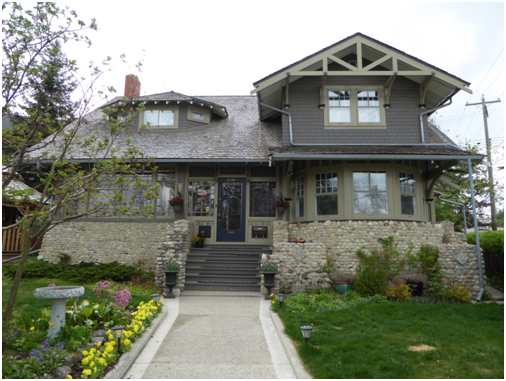 The human-style architecture and early Victorian-style homes remain as a reminder of Calgary’s past. ‘Art Walk’ is a yearly event. 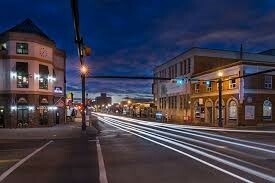 Calgary is over a million people and 17th Avenue still shines brightly. Many of the hopes for the Avenue have come true. An artistic and fashion hub, it may be the most popular restaurant and entertainment district in Calgary. Western Canada High School reached its 100th Anniversary with a $50 million renovation, Reunion and Open House. 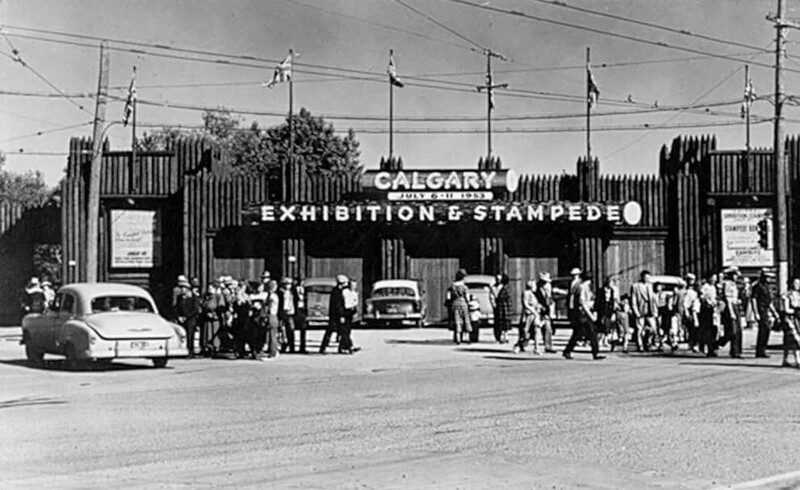 The Calgary Stampede has celebrated 100 years, growing further into Victoria Park. ‘Cowboys Dance Hall’ and Casino, ‘Weadickville’, zip-lining and Nightclubs, provide something for everyone, including art, agricultural shows and midway rides. The Saddledome functions year-round as a concert and sports venue. The re-named ‘Indian Village’ at the Stampede grounds is now ‘Elbow River Camp’. Treaty 7 Band families set up authentic tipis for Calgary Stampede. A permanent brick structure called ‘Sweetgrass Lodge’ has a performance stage to attract audiences for traditional dancing and drumming. 17th Avenue special events include The 1988 Winter Olympics. The Saddledome housed Olympic sports events such as hockey, singles figure skating and ice dancing pairs. Calgary’s historic 2013 flood touched 17th Avenue when the Elbow River filled the Stampede Barns, disrupting the flow of people and commerce on the avenue. Yearly road construction wreaks havoc for transportation yet 17th Avenue is resilient. 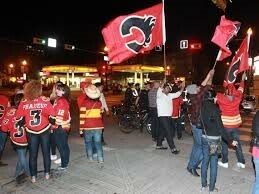 Sport fans remember the Stanley Cup playoff run of 2004 when a stretch of the Avenue was dubbed The Red Mile during the Calgary Flames’ Stanley Cup play-offs. 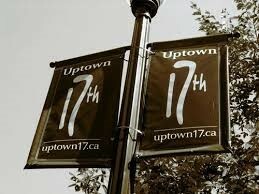 Uptown 17 is not a passing fad. Tomkins Park provides benches, a gazebo for pancake breakfasts and large shade trees for passers-by. People-watching is a leisurely sport from parks, pubs or coffee shops on the Avenue. Following the Avenue’s western route inevitably takes us to the Rockies, a place we love to visit. A backward glance reveals the Calgary skyline, the 50-year-old Calgary Tower and the asphalt ribbon that ties us back —to 17th Avenue. ‘Let’s hope that Calgary keeps the love for 17th, its creative approach to style, love of the arts and reminders of the past. It’s one of our Avenues that makes Calgary great… the people, buildings and trend-setting ways. 1. 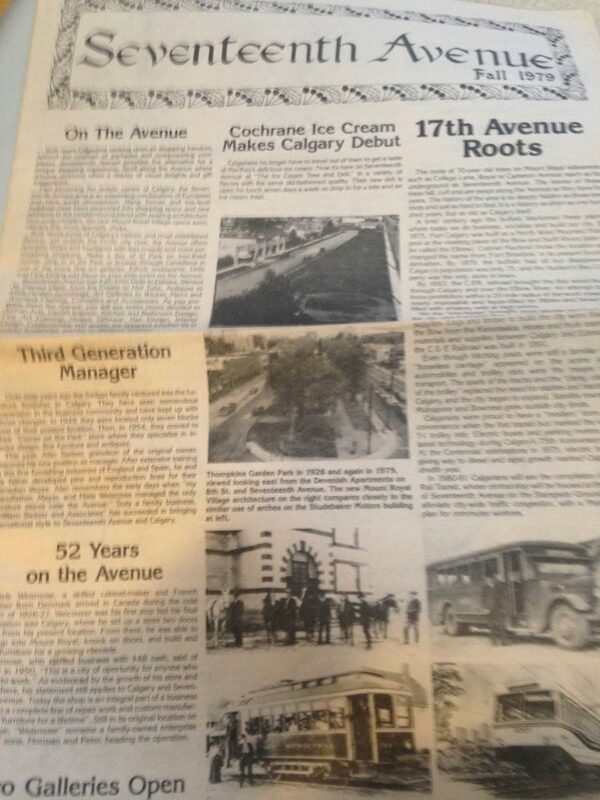 Original copies of ‘Seventeenth Avenue Newspaper’ and ‘Calgary Avenues’ available in The Glenbow Museum Archives and Calgary Public Library. Patricia Paterson is a Calgary author, posting Calgary History facts and stories on the Calgary Heritage Initiative (CHI) website. She is currently writing a war-time novel called ‘Perfect Circle’, poetry and ‘character tales’ set in modern and ancient Calgary, Scotland and the Rockies. Patricia is a member of CHI. The Calgary Heritage Initiative Society posts member submissions or shares media articles that are relevant to CHI’s role as an advocacy group dedicated to the preservation, productive use, promotion and interpretation of buildings and sites of historic and architectural interest in Calgary. CHI is not responsible for errors or omissions in these submissions and posts. The opinions, beliefs and viewpoints expressed by the various authors do not necessarily reflect the opinions, beliefs and viewpoints of the Society.